Lying between the Big Hole Valley and the Greater Yellowstone Ecosystem is the Madison Valley, home to one of Montana’s glittering blue-ribbon trout rivers, wilderness gateways for hikers and hunters, and the outdoor tourism industry that follows these opportunities. In the last decade, that industry has grown considerably, thanks in part to the advent of vacation-home rental platforms like VRBO and AirBnB. It all begs the question: can tech coexist with bears? Where vacation rentals in the Madison used to attract fewer and longer stays, the ease of booking a VRBO for a week of fishing now brings many hundreds of new faces to the area each season. With the valley just 20 miles west of Yellowstone, these crowds come from far and wide, and their experience levels with grizzly bears also vary widely. That’s where People and Carnivores enter the picture. This small coexistence-minded organization has been working in communities outside of Yellowstone for more than 20 years. Now, with Vital Ground’s support, it is targeting vacation rentals in the Madison Valley with an expanded suite of bear-aware essentials. 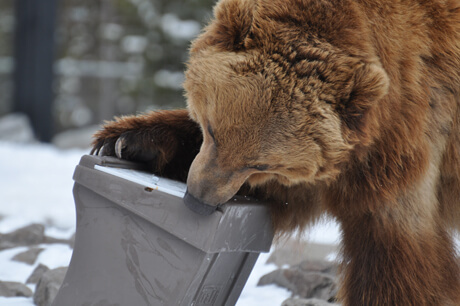 The new initiative will partner with vacation-rental owners to invest in bear-proof garbage containment and bear safety education on everything from print brochures to online videos to refrigerator magnets. As Yellowstone’s grizzlies range west and tourists follow, we’re proud to help bear-proof this iconic area for the benefit of every new arrival, whether grizzly or human.